SHANGHAI, Nov. 2, 2018 /PRNewswire/ -- As part of the first China International Import Expo (CIIE), the Hongqiao International Economic and Trade Forum ("Hongqiao Forum" or "the Forum") will hold its grand opening on November 5 at the National Exhibition and Convention Center in Shanghai. Running for one day with multiple sub-forums, participants at the Hongqiao Forum will explore ways that business and government can work together to bring new force and vigor to the global economic and trade sector. The Forum will consist of multiple sub-forums covering topics such as "Trade and Openness," "Trade and Innovation" and "Trade and Investment." Big names in the global business world and leaders of renowned international organizations, including Bill Gates of TerraPower and Alibaba's Jack Ma, Dean Zhu Min of National Institute of Financial Research of Tsinghua University, as well as Mukhisa Kituyi, Secretary-General of the United Nations Conference on Trade and Development (UNCTD), will be in attendance. These forums will cover detailed issues such as how to increase the freedom and convenience of trade and investment, how to build an open economy, how to drive new growth in trade through service trade, the digital economy, e-commerce and others, and build a future of sustainable economic and trade growth. One sub-forum, the "International Financial Media and Think Tank Forum," will feature representatives and editors of major international financial media outlets, representatives from national culture and communication bureaus, and think tank experts who will gather to talk about communications and the role of think tanks in developing open economies. State-level leaders from various countries will attend the opening ceremony of the Hongqiao Forum. The sub-forums will feature keynote speeches given by important guests from the worlds of politics, business and other sectors. There will also be seminars and discussions joined by prominent experts and government officials from around the world. In addition to the Hongqiao Forum, there will be over 100 supporting events during the first CIIE running from November 5-10. Produced by CIIE's participating countries, local governments in China, State-owned enterprises, exhibitors and many others, the events will cover sectors including intellectual property, cross-border commerce, tourism, global agriculture, technology, as well as major issues related to China's Belt and Road Initiative. Through significant events such as the Hongqiao Forum, the first CIIE offers an international platform for countries to showcase their latest achievements and seek opportunities for cooperation in trade. It is also of great importance as a public service provider to initiate and facilitate communication and discussion of major issues in global trade and the economy, and to build a better economic environment. 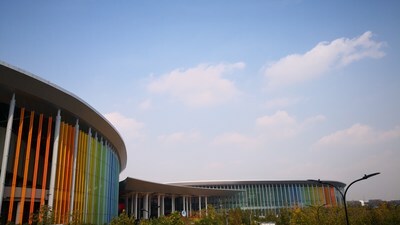 The China International Import Expo (CIIE), organized by the China International Import Expo Bureau and National Exhibition and Convention Center (Shanghai) Co., Ltd, is jointly sponsored by the Ministry of Commerce of the People's Republic of China and the Shanghai Municipal People's Government. It is the first exhibition of its kind to be supported by international organizations such as the WTO, UNCTAD, and UNIDO.